A man walks past an electric market board in central Tokyo, Friday, Jan. 9, 2008. 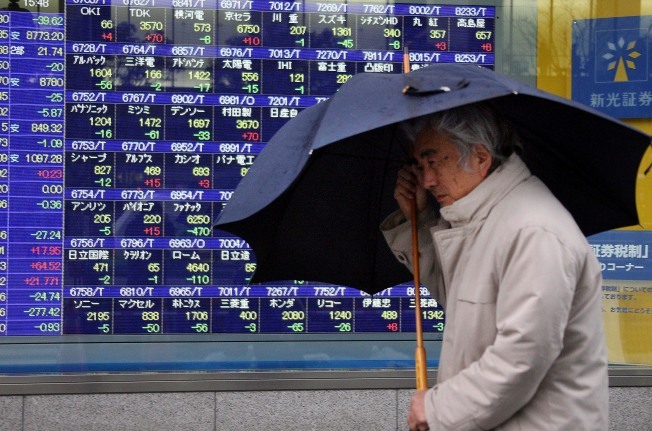 Asian stock markets retreated Monday, with benchmarks in Hong Kong and South Korea off about 2 percent, as a jump in U.S. unemployment intensified concerns the global economy is facing a prolonged slump. Investors were rattled by a much-anticipated report released Friday that showed the unemployment rate in the world's largest economy increased to a worse-than-expected 7.2 percent in December from 6.8 percent in November. Meanwhile, employers cut 524,000 jobs, bringing job losses for all of 2008 to 2.6 million — the most since 1945. While hardly surprising, the figures were still more evidence that the magnitude and duration of the global recession could be worse than many anticipated. For Asia, the news was especially unsettling as rising unemployment hurts consumer spending and erodes demand for the region's exports. "After the grim reminder of the U.S. labor market, I think there's the realization that it's not going to be an easy ride," said Song Seng Wun, head of research at CIMB-GK in Singapore. "Investors fear the global economy might be tanking worse than even pessimists expect." Hong Kong's Hang Seng Index fell 275.86 points, or 1.9 percent, to 14,101.58, and South Korea's Kospi dropped 24.21 points, or 2.1 percent, to 1,156.75. Japan's market was closed for a national holiday. Mumbai's Sensex benchmark lost 2.1 percent, thought shares of embattled outsourcing giant Satyam Computer Services Ltd. rebounded 40 percent after Indian authorities Sunday named three business leaders to its board to help turn around the firm. Key stock measures in Australia and Singapore shed about 1 percent or more. Taiwan shares also fell. Shanghai's main index, down early in the session, recovered to add 0.6 percent amid a statement from Premier Wen Jiabao that China's efforts to break out of an economic slump were starting to show results, with the economy performing better than expected in December. China's December trade figures are due to be released Tuesday, and analysts expect more weakness amid lackluster global demand. China's exports fell in November for the first time in seven years and manufacturing activity shrank in December for a third straight month. U.S. investors, also unsettled by the jobs report, sent stocks veering lower Friday. The Dow Jones industrial average fell 143.28, or 1.6 percent, to 8,599.18, logging a 4.8 percent decline for the week, its biggest point and percentage loss since the week ended Nov. 21. Broader stock indicators also declined, with the Standard & Poor's 500 index falling 19.38, or 2.1 percent, to 890.35. U.S. futures traded lower, signaling a weak open on Wall Street. Dow futures fell 12 points, or 0.1 percent, to 8,511 and S&P500 futures slipped 3.4 points, or 0.4 percent, to 882.10. Oil prices edged lower, with light, sweet crude for February delivery down 58 cents at $40.25 a barrel in Asian trade.